Even chimpanzees can have late-in-life babies! A 42-year-old female chimpanzee whose unexpected pregnancy was discovered in February has given birth to a healthy girl, officials at a sanctuary said. Ginger gave birth Monday but the announcement was put off until Wednesday to make sure both were healthy and the baby was nursing well, said Amy Fultz, behavior and education program manager at the 200-acre Chimp Haven sanctuary for retired research chimpanzees. Ginger's pregnancy was discovered after another female in her group gave birth on Valentine's Day. Both were surprises because every male must get a vasectomy before coming to Chimp Haven, where 125 chimps live in smaller social groups, as they do in the wild. 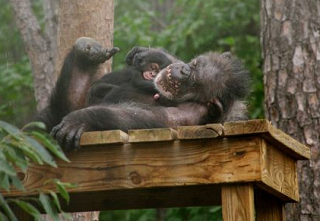 Chimp Haven is near Keithville in northwest Louisiana.